Huge challenges are ahead of of us in the next decade and beyond concerning computing and storage power, efficient and optimal data reconstruction and analysis. The workshop aims to discuss options and the strategy of our community on computing and software development e.g. the computing model for the high luminosity phase of the LHC and the BELLE-II program. The aim is to involve bring all interested parties. In particular young people are encouraged to participate. The campus is reachable by foot from the main station ("Wuppertal Hauptbahnhof" aka "Wuppertal-Elberfeld"), but you can also take one of several busses going here. Please note that from the busses mentioned in the link, only the busses marked "615" or "645" actually stop at the main entrance. The other lines mentioned there have stops close to the campus but we would not recommend using those if your are not familiar with the area. If you do not have a ticket, you need a ticket "A3" available from vending machines or the bus driver (€2.80 for a single ride). The closest airport in Düsseldorf International, which offers many daily connections, including several from Geneva. Most of these services are offered by Eurowings. From there, you reach Wuppertal by train. The airport has two train stations: one inside the terminal (lowest level) offering connections with the commuter train ("S-Bahn") and a main line station ("Fernbahnhof") for nationwide connections. The main line station is reachable after a short ride with a suspension railway. It is highly recommended to take the commuter train from the terminal station and change trains at Düsseldorf main station. There are about 5 hourly connections between Düsseldorf and Wuppertal, either by "S-Bahn" (30mins) or "Regionalexpress" (20min). To find you best connection, visit the Deutsche Bahn website and search for a connection from "Flughafen Terminal A/B/C, Düsseldorf" to "Wuppertal Hbf" and choose "Local transport only". You gonna need a ticket level "B" from the Rhine Ruhr area transport network ("VRR"), price €5.90 for a single ride. Tickets are available from vending machines at the station only, they are not available inside the trains! The ticket includes the bus to the campus in Wuppertal. There are (still) huge works ongoing at Wuppertal main station! If you want to walk and are lost, follow the signs to "Stadthalle" first which should get you to the right direction. Do NOT follow the path to "Südstadt". If you plan to come by car, please follow these instructions. Parking is available free on campus, but please note that the park garages are closed during the night (from 22:30h). The meeting will take in the conference room K5, which are located in the building "K". Click on the map for a larger version. Take the entrance from the "Gaußstr. ", a lift (or stairs) will take you to the "base level" of the building. There turn left, the room will be on your left. .. will be provided during the coffee breaks. There is the option for a joined dinner. We reserved a table at the "Kneipe", a restaurant/pub on Campus. Please select your choice of dinner in the appropriate section during the registration process. If you want to have lunch, please check out the options provided by our Hochschulsozialwerk. 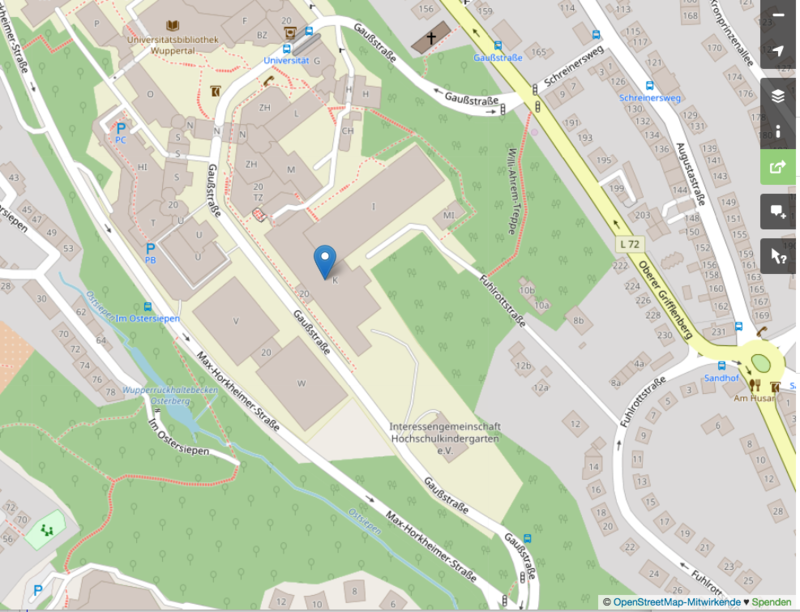 We would recommend that you either visit the Mensa (in building ME, down the hill) or the cafeteria "Sport & Design" which is in the building "I" close to the meeting location. The university participates in the "Eduroam" initiative and Wifi is available on the whole campus.